Where better for a Winter Olympic Games than famously arid north China? Drought and a fast growing economy have created water shortages so severe that China’s government has spent more than a decade, and up to US$80 billion constructing 2,400 kilometres of canals and tunnels, to pump 45 billion cubic meters of water from the moist south to the parched capital and surrounding areas. Undeterred, the Beijing 2022 Winter Olympic Games campaign has already slalomed its way through the crucial first round by clinching nomination as a candidate city, with a bid wholly dependent on manmade snow. Only one rival remains in the race, Almaty, in neighbouring Kazakhstan. Oslo was looking a strong choice until the Norwegians mysteriously withdrew in October. Success for Beijing at the IOC’s July 31 meeting would make it the first city to host both Summer and Winter games, a double win. Lack of snow would seem to be a major problem, even for Beijing’s expert weather managers, who used cloud seeding techniques to dump heavy summer rains away from the 2008 Olympic Games opening ceremony. In north China, the rainy season is summer. During the mid-winter months, precipitation around Beijing averages 2.5 millimetres, too little to guarantee even a thin sprinkling. Small ski resorts near the capital use snow making machines. One of them, Yanqing, about 90 minutes from the city, would host alpine ski events and bob-sleighing. Even local hoteliers are sceptical.“This is definitely not the best place to have a big winter activity, at least for snow sports," Fabio Ries, the general manager of the nearby Dolomiti Mountain Resort, told the AFP news agency. To solve this, Zhangjiakou, in northern Hebei province near Inner Mongolia, is being proposed as co-host for the majority of ski and snowboard events. Its snowfall averages one metre a year. What stays on the ground is usually less than a foot deep, still not enough. “As there are abundant water resources near the ski resorts and the melted snow will be recycled, snow-making during the Games will not have any negative impact on the local eco-system,” according to the bid committee’s candidature file. But where will this water come from? It seems it will be pumped from reservoirs, which means ultimately from rivers. Bid organisers say there will be no extra water demand beyond ski resorts’ existing thirst, and “very limited” impact on reservoirs. “The water storage ponds and water delivery systems needed…[are] already in place,” the Beijing 2022 media office said in an email. That is because of a recent construction blitz to bolster Zhangjiakou’s prospects as a ski resort, and China’s fledgling ski industry. Work will finish this year on the Yunzhou Reservoir water diversion project, capable of diverting 5 million tonnes of water annually; its main storage pond is at Changchengling in the Games Zone. 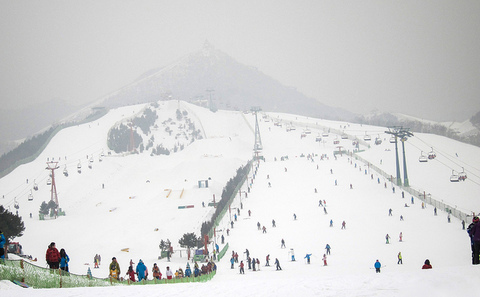 Yunzhou will supply 360,000 cubic meters of water for snowmaking. However, Zhangjiakou’s famously fragile eco-system has attracted an avalanche of researchers. Declining rainfall since 1997 and rising temperatures – up 0.4 degrees C each decade since 1960 and 0.68 degrees in winter – has depleted the Qingshui River and led to overexploitation of ground water, according to a study in the Chinese Journal of Agrometeorology. Water scarcity is so problematic that the city was the focus of experiments to increase the “productivity of limited water resources through rational water use allocation” by environmental scientists from Beijing Normal University. The bid committee’s Environmental Impact Assessment, acknowledges some risks, including, “Possible damage to vegetation, soil disturbance, impact on the habitat of some birds and dust and noise pollution” in all three zones -- Yanqing, Zhangjiakou and Beijing. Not mentioned, though surely inevitable, is the heat island effect of building hotels, leisure facilities and conference centres to house the games, and the longer-term stresses on groundwater they will bring if the event is to deliver the promised 20% boost to local GDP. Beijing’s smog has worsened since the 2008 games created worldwide awareness of China’s rapid modernisation and, less happily, its toxic air quality prompted embarrassing rows about how athletes could protect themselves. The Beijing 2022 bid is highlighting environmental commitments, promising a green games. Pledges include changing the Beijing-Tianjin-Hebei region’s energy mix, better air quality, and a carbon neutral games, partly achieved by planting 70,000 hectares of trees to create “carbon sinks,” and protect watersheds. “Sustainability will be implemented in all aspects of Beijing 2022; clean energies will be developed and energy-saving and eco-friendly technologies and products will be applied extensively,” the candidature file says. Specifics include renewable energy at 15 new Olympic venues, and 540 clean energy buses for Zhangjiakou. However, some of the more dramatic pledges, such as the promise to slash annual regional coal use from 23 million tonnes to less than 10 million tonnes, simply reiterate existing policy targets. For instance, “Beijing is making every effort to carry out the Clean Air Action Plan 2013-2017”. Just as with the 2008 hosting, national economic development is a central goal. China is now a majority urban nation, so experiments in better co-ordination between cities have become a priority. One such area is the Beijing-Tianjin-Hebei Region, declared a project within the National Strategy of Integrated and Coordinated Development in a February 2014 document. Even with all scientific data available now, the organisers have definitely ignored the facts of this coming ecological disaster. Zhangjiakou has been totally exploited by greedy developers that apparently have so much cloud that they can push an absurd agenda. The local people in already impoverished Zhangjiakou where most of Beijing's air pollution comes from will be to say the least not happy as their groundwater has already been stolen from them for cheesy ski resorts that have already had a huge impact on both local people's rural economy. If the Olympic committee is as trustworthy as the FIFA then sure we will have another greedy man made Olympics, where only a few stand to profit and a majority gets cheated again and again by false promises, bad science and a purposely blind government. It is these kind of people that we should be most afraid of..
Mary Hennock is a journalist and editor. She has worked for Newsweek from Beijing and for the BBC in London. Her work has also appeared in The Guardian. Sour Olympic legacy for Russia? Eyes are now on the next chance for Olympic glory: 2014’s winter games in Russia. But preparations have included an ominous change in conservation law. With the flame now extinguished at the "Bird’s Nest" stadium, China should unite the country around the great successes – and formidable challenges – of the green Olympics, writes Wen Bo. The opening ceremony of the London Olympics projects an image of rural tranquility. But the story of a peasant poet of the early 19th century is truer to Britain's actual experience and the relationship of people to environment, says the British activist George Monbiot.